• Ernesto M. Dionisio, Jr.
• Ernesto C. Isip, Jr.
• Roberto R. Ortega, Jr.
ម៉ានីល (អង់គ្លេស ៖ Manila /məˈnɪlə/; Filipino ៖ Maynila, [majˈnilaʔ]) គឺជារដ្ឋធានី និងជាទីក្រុងធំទី២នៃប្រទេសហ្វីលីពីន។ It is one of the sixteen cities (along with the municipality of Pateros) that make up the National Capital Region called Metro Manila which has a population of 12 million. 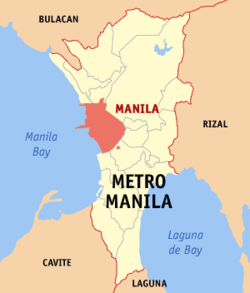 The City of Manila is located on the eastern shore of Manila Bay and is bordered by the cities of Navotas and Caloocan to the north; Quezon City to the northeast; San Juan to the northeast; Mandaluyong to the east; Makati to the southeast, and Pasay to the south. Manila has a total population of 1,652,171 according to the 2010 census and is the second most populous city in the Philippines, behind Quezon City. The populace inhabit an area of only 38.55 square kilometers, making Manila the most densely populated city in the world. The city is divided into six legislative districts and consists of sixteen areas: Binondo, Ermita, Intramuros, Malate, Paco, Pandacan, Port Area, Quiapo, Sampaloc, San Andres, San Miguel, San Nicolas, Santa Ana, Santa Cruz, Santa Mesa and Tondo. Bustling commerce and some of the most historically and culturally significant iconic landmarks in the country, as well as the seat of the executive and judicial branches of the government are found in the city. Manila is also home to many scientific and educational institutions, numerous sport facilities, and other culturally and historically significant venues. Listed as a global city, Manila has its strengths in the arts, commerce, education, entertainment, finance, healthcare, media, professional services, research and development, tourism and transport making it the historical, cultural, political, economic and educational center of the Philippines. The earliest written account of the city is the 10th-century Laguna Copperplate Inscription which describes a context of an Indianised kingdom maintaining diplomatic relations with the Kingdom of Medang. The city was invaded by Brunei's Sultan Bolkiah and was already Islamized by the 15th century when the Spanish Conquistadors first arrived. Manila eventually became the center of Spanish activity in the Far East and one end of the Manila-Acapulco Galleon trade route linking Latin America and Asia. The city would eventually be given the moniker of the "Pearl of the Orient", as a result of its central location in the vital Pacific sea trade routes. Several Chinese insurrections, local revolts, a British Occupation and a Sepoy mutiny also occurred shortly thereafter. Manila also saw the rise of the Philippine Revolution which was followed by the arrival of the Americans who made contributions to the city's urban planning and development only to have most of those improvements lost in the devastation of World War II. Since then the city has been rebuilt.